As of July 2015, 191.4 million people in the U.S. owned smartphones¹, a number that includes nearly two-thirds (64%³) of all adults. Recent data also shows people are spending more time on these devices than with their former flame, television, clocking in at an average of 2 hours and 57 minutes with their hand-held screens versus 2 hours and 48 minutes with their larger, less-portable counterpart. This, of course, shouldn’t come as a surprise. Mobile usage has been on a meteoric rise with every technological advancement and iPhone release, while television viewing has remained steady. 2016 is also projected to be the first year mobile ad spends² will surpass all other digital ad spends, a clear indication the shift to mobile hasn’t escaped the attention of marketers and brands either. But, while mobile has shrugged the “second-screen” distinction to become the primary media source for the American public, there is less consensus among businesses and brands about how to adjust to this new market landscape beyond the necessity to “be there”. As a creative studio focused on brand experience, we’re constantly evaluating the opportunities and challenges mobile presents for our clients. But one thing that we’ve noticed in our discussions about the mobile space is that, while everyone is talking about “mobile”, we’re not all talking about the same thing. To better understand how different industries are defining and adapting to a mobile driven mindset, we decided to talk to some of our current and past clients as well as our friends at CabForward, a mobile development company, to find out what commonalities exist in the variety of strategies and approaches being used. One of the few common threads we’ve found is the understanding that mobile isn’t a tool/channel/tactic, but the idea of content that can be accessed anywhere at any time. 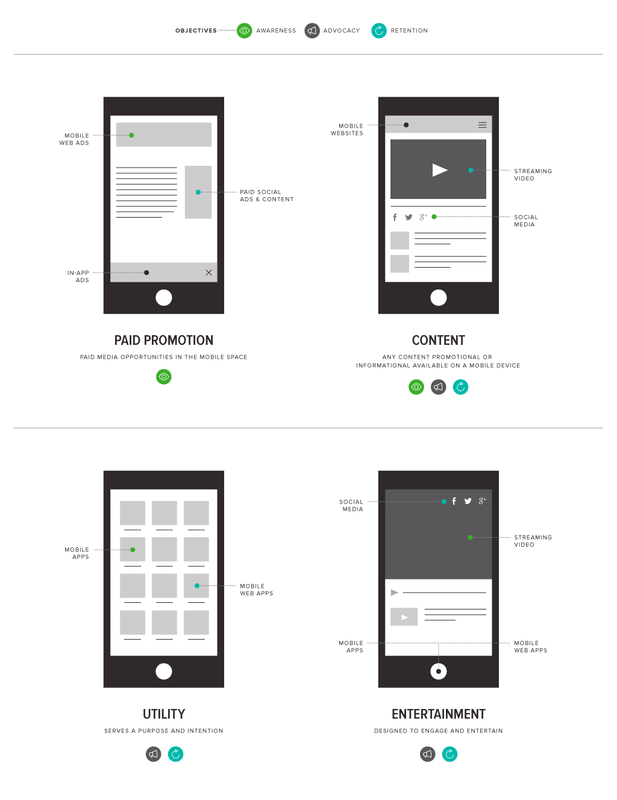 This baseline, mobile as access, provides the basic framework on which a mobile strategy should be based – delivering content when, where and how people want it. In the most basic sense, this is what we are all talking about when we talk about mobile, but beyond this consensus lies little in the way of common ground. Social media apps like Facebook, Twitter and Instagram illustrate the mobile as access concept, consistently ranking in the top charts for both mobile and online traffic – while all social media is not strictly mobile, it is accessed from mobile phones in significant numbers. Most of the above category breakdowns are simple and straightforward. Some overlap depending on how they may be used. For example, social media is included in two categories, Content and Entertainment. We’ve included Apps only in the Utility and Entertainment categories. One of the key learnings we learned from speaking with clients and partners and in reviewing the top apps is people expect apps to have a key function and/or serve a specific purpose. As the mobile web has improved over the last few years, there are fewer and fewer content apps with the exceptions for large media companies like Buzzfeed and CNN, who can leverage their existing content and audiences. Mobile is web. Web is mobile. Social media is mobile. Software is mobile. The day when these were unique entities is long gone and you shouldn’t be thinking of them separately anymore. We have long since developed frameworks and techniques that allow us to create one set of content, designs, assets, functions, systems, etcetera that can then be implemented and optimized in each and every platform out there. Desktop vs mobile, android vs iOS, these are distinctions and indications that people either don’t know the market or are trying to take advantage of those who don’t. You need to consider and optimize for any differences between mediums. But, just as the TV script can be leveraged on radio, your brand content can and should be the bedrock on which your mobile experience is based. Streamline, simplify, yes. But quit thinking of mobile as a separate experience or strategy. Ultimately, the goal of mobile is to deliver a brand experience that falls within the best practices for mobile sizes and usage patterns. Stay tuned for our recommendations with CabForward on how to maximize your investment and approach.